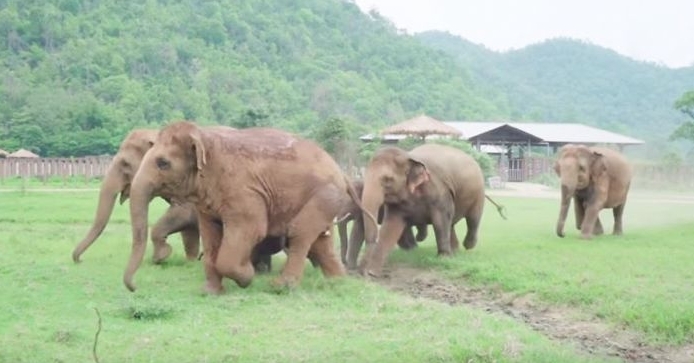 A video showing the whole elephant herd running to greet a rescue baby elephant is going viral, and for obvious reasons. The short clip filmed at Elephant Nature Park shows 1 year and 9-months-old orphan elephant Dok Gaew who receives the warmest welcome ever. They can surely teach us a thing or two about friendliness, empathy, and co-existing in peace. These wonderful creatures are known for their gentle nature and enormous physical strength. They are matriarchal, i.e. females are the ones who run the world in the elephant kingdom. Oh, and they are herbivores, which means they don’t kill for food or just because they want to. And did we mention they don’t harm the planet as humans do? Let’s be more like elephants, shall we? Elephants naturally understand when to lend a helping trunk much as people know when to lend a helping hand, displaying a complex level of cooperation confirmed only in humans and our closest relatives until now. Elephants are widely regarded as possessing advanced brains, displaying levels of intelligence seen only in humans, dolphins, chimpanzees and others capable of higher forms of thinking. For instance, elephants recognize themselves in mirrors, learning that such reflections are images of themselves and not others, behavior apparently unique to species that show complex empathy and sociality. Responses to "Watch 'n cry: Elephants run to greet a rescued baby elephant"